It boasts a superior level of water absorption and high water retention capacity. An innovative and easy to install system that boasts superior water absorption and high water retention capacity designed for various landscaping applications: residential gardens, sports fields, commercial spaces, cemeteries, public parks and more. *Significantly reduced water consumption is just one of the primary advantages of the innovative Urbanscape Landscaping System from Knauf Insulation, which is designed to meet the many challenges associated with water management. Order your Urbanscape® Landscaping System demo folder to touch and test the Urbanscape® Green Roll. Urbanscape® Green Roll and other Urbanscape landscape-shaping materials (Green Flocks / Green Cubes) are made of natural rock mineral wool fibres with superior water absorption and water retention properties. Virgin mineral fibres provide additional water storage, releasing water when required and protecting the water from percolation and reducing evaporation at higher temperatures. The system also works to promote better root distribution, which in turn encourages good plant growth and development. All this and more make Urbanscape® landscaping materials the best, most versatile solution for growing plants in the most demanding of environments. Learn more about the Urbanscape® Landscaping System materials and download the brochure or product data sheets. Urbanscape® Green Rolls deliver fast and long-term stable water re-absorption and water retention performance. A mere 1m2 of Urbanscape Green Roll just 2 cm thick absorbs a whole 17 litres of rainwater. Depending on the local climate and the weather / season, water savings of up to 75 % can be achieved. 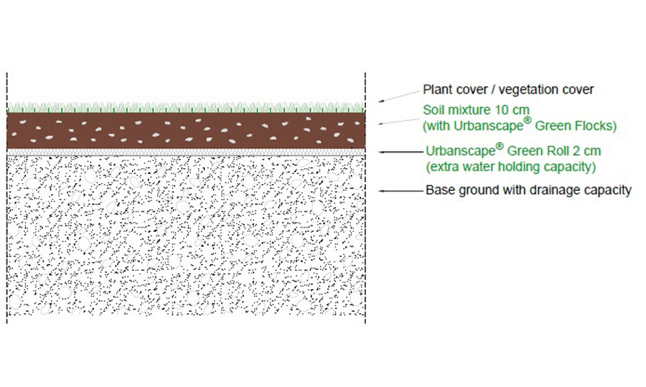 Urbanscape® Geen Rolls ensure that the right amount of water is made available to plant roots over extended periods of time. As a result, the need for additional irrigation systems is substantially reduced. The water made available in reservoirs created by Urbanscape® Green Rolls ensures proper plant root growth and well dispersed root distribution. One major advantage of Urbanscape® Green Rolls are their ability to reduce storm water runoff, which translates into lower burdens on sewer systems. It can lower costs by eliminating the need for rain caching cisterns and similar equipment commonly used to manage storm water. And high rainwater retention capability helps reduce the number of accidents caused by heavy rainfall. 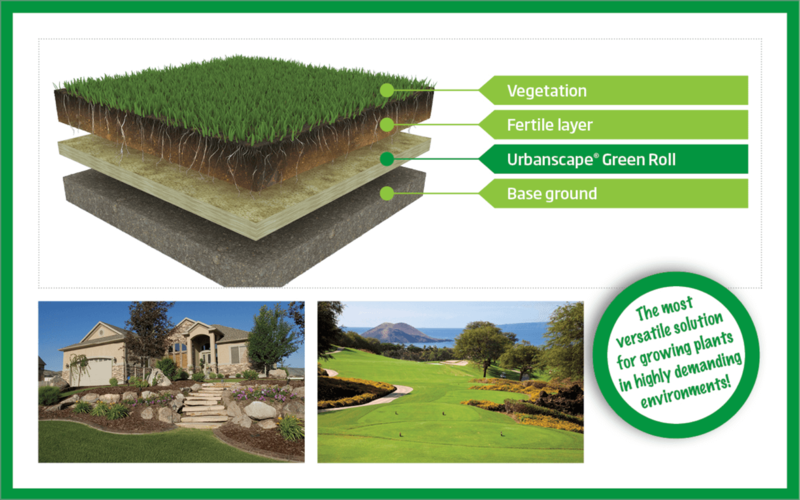 Urbanscape® Green Roll is made from various common rock mixtures that are widely available in nature. The lightweight open structure of the product promotes extensive root distribution and vigorous plant growth. Urbanscape® Green Roll is extremly lightweight and easy to install. By placing Urbanscape® Green Rolls below the soil layer or any other growing media, the water-retention capacity and aeration are improved. That makes the water and nutrients easily accessible to plants. Urbanscape® Green Roll and other Urbanscape landscape-shaping materials (Green Flocks / Green Cubes) are made of natural rock mineral wool fibres with superior water absorption and water retention properties. 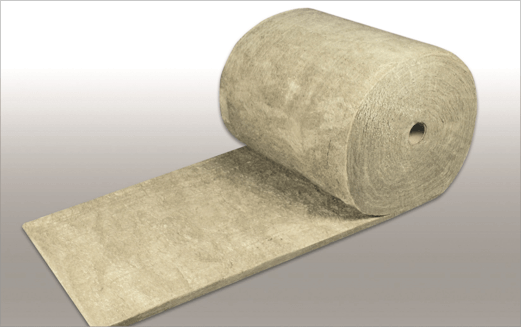 Urbanscape® Green Roll for Landscaping is made of needled rock mineral wool to form a compact and dimensionally stable felt. 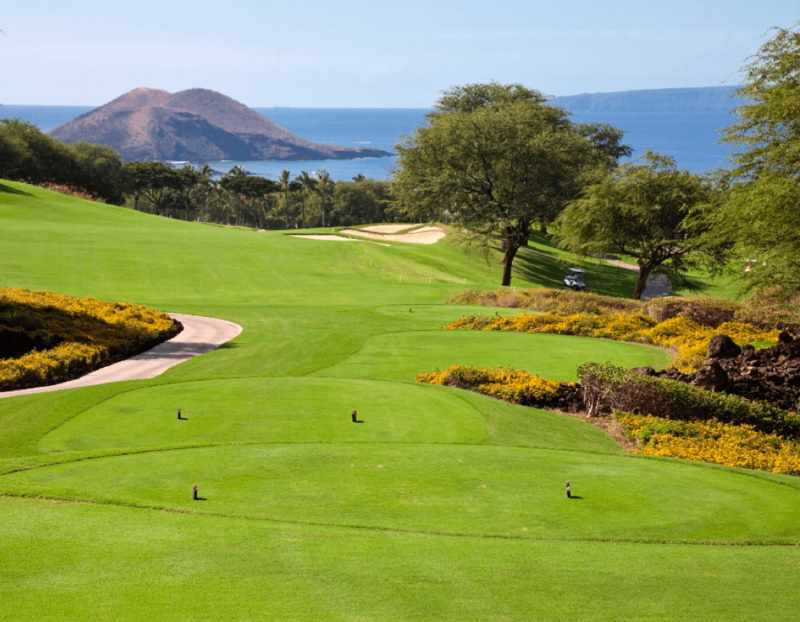 Using Urbanscape Green Roll in various landscaping applications provides better water absorption, retention and distribution, which in turn results in better plant growth and more attractive plants. Rock mineral fibres are produced in a heating process entirely without any chemical binders and have superior water storage and release capabilities that make water and nutrients easily accessible to plants. This in turn improves soil structure and reduces environmental stress on plants. 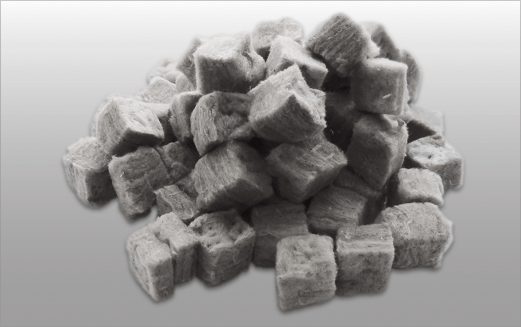 Urbanscape® Green Cubes are made of needled rock mineral wool. Green Cubes are used as a growing medium for the professional cultivation of plants or as a high quality additive used to improve soil and save water in a variety of different landscaping applications. Rock mineral fibres are produced in a heating process entirely without any chemical binders and have superior water storage and release capabilities that make water and nutrients easily accessible to plants. This in turn improves soil structure and reduces environmental stress on plants. 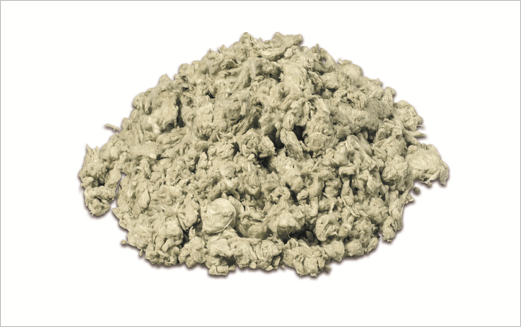 Urbanscape® Green Flocks are made of needled rock mineral wool. Green Flocks are used as a growing medium for the professional cultivation of plants or as a high quality soil enhancer used to improve soil and save water in a variety of different landscaping applications. Rock mineral fibres are produced in a heating process entirely without any chemical binders and have superior water storage and release properties that make water and nutrients easily accessible to plants. This in turn improves soil structure and reduces environmental stress on plants. A set of several detailed Urbanscape® Landscaping system drawings for different environments and climates was made to assist architects and other designers with their work.